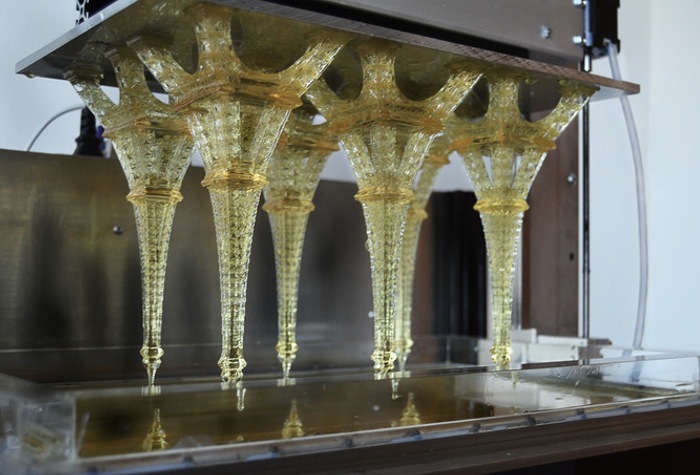 A new desktop DLP Solidator 3D printer has been created that has been designed to provide users with a larger than standard print area as well as the ability to print quicker models using DLP-Stereolithography and specially formulated materials. The Solidator 3D printer has been created to harden an entire 0.1 mm layer all at once, without the typical moving heads or lasers that do nothing except waste your precious time. This makes Solidator the fastest liquid plastic resin printer around, without sacrificing quality. Watch the video after the jump to see it in action. “The Solidator 3D printer features a huge build area that is 3-4 times larger than that of most other commercial stereolithography printers and even a lot higher than those of the most FDM printers. No longer will you be limited to small prints – the 588cm² print area yields objects that are truly massive by comparison. The Solidator 3D printer can print features as small as 270 microns (0.0106 inches) and layer heights from 100 microns all the way down to 30 microns. This leads to impressive results. We are saving you time and providing really high resolution prints on a huge build platform. We think that if you want to print a robot, RC car, engineering parts, electronics enclosure you will need a massive 280x210x200mm – 11.8 liter build volume or you just want to save time by printing several objects at once, you need a Solidator! The Solidator 3D printer project is currently over on the Kickstarter website looking to raise enough pledges to make the jump from concept to production. So if you think Solidator 3D printer is something you could benefit from, visit the Kickstarter website now to make a pledge and help Solidator 3D printer become a reality.